This first part of The Blacklist’s second season has been all about revenge and the lengths people will go to find the revenge they seek. What’s interesting about “The Scimitar”—where this theme is most prevalent—is who uses violence and intimidation to achieve revenge, and those who use other tactics in order to stop it. As with most episodes, unfortunately, “The Scimitar,” is weakened by the weekly story occurring amongst the stuff that really matters. At the very least, “The Scimitar” does what last week’s “The Mombasa Cartel” tried to do, by tying the baddie-of-the-week into the backstory of one of our characters, but it doesn’t work as effectively as it did with Dembe. What really matters about The Scimitar is that he is responsible for killing Samar Navabi’s brother, and her attempt at getting revenge against him is why The Scimitar is in town trying to kill one of America’s top nuclear scientists in the first place. As usual, the mechanics of what The Scimitar’s larger goals are aren’t really that important, it’s about where they take the characters. The show tries to throw in a few curveballs, such as having Keen, Ressler, and a man they’re trying to protect get in a car accident, then end up in the hospital that’s actually a front, run by The Scimitar. But it’s such an obvious twist, it’s almost silly. Also, the accident that gets Keen and Ressler in the fake hospital just reminds us that The Blacklist is pretty awful at directing any action of any kind. Their slow-mo reactions to the car flipping over and over are actually laughable. But what happens to The Scimitar when Reddington eventually finds him is interesting. Instead of turning him in to the FBI, he lets Samar do with him what she pleases. It doesn’t look like she’ll take out her revenge. But later in the episode, we find out that The Scimitar was found with a bullet in his head, so…I think it’s safe to assume she went through with it. Liz is also enacting her own dual attempts at revenge, first with her husband Tom, who is chained inside of a boat for Liz to interrogate at her leisure. Liz is trying to find out information about Berlin, since he’s the one that caused all of this Tom business in the first place. This is all well and good, but what really matters is what Liz does with Tom, once she’s drained him of all information. Liz has changed greatly since we first started off with her at the beginning of the series, so going down that rabbit hole of premeditated murder would be a whole new step towards how dark she can really become. What I find most fascinating about “The Scimitar” is the lengths Reddington will go with some people to help them get bloody revenge, while trying to keep his hands clean as much as possible, even while seeking his own. For example, he is completely okay with Liz’s plans to find Berlin and kill him instead of turning him into the FBI, just as he also gives The Scimitar to Samar on a silver platter. But with his own plans, Reddington is much more plodding and deliberate with his actions. Ever since Zoe has been introduced to the show, there’s been speculation that she could be his daughter. But of course The Blacklist wouldn’t answer the question of who Reddington’s daughter is—which it’s been dragging out for a season and a half. It turns out Zoe is Berlin’s daughter—the daughter that Berlin thought was dead, and the one who is the reason he’s gone after Reddington so fervently, for so long. So clearly the intel he’s received from someone else is faulty, with someone trying to play Reddington and Berlin against each other for some unknown reason. Even though it’s great that we see our characters headed in dark—and hopefully interesting—directions, “The Scimitar” is just sort of bland. It’s as convoluted as this show usually is, but it also tries to be clever and fails, with the audience able to stay one step ahead of every twist and turn. If you can pull off the twists, the episode should be exciting, but without them, it’s just boring and predictable. It’ll be great if next week’s fall finale ups the limits that “The Scimitar” tries to push. 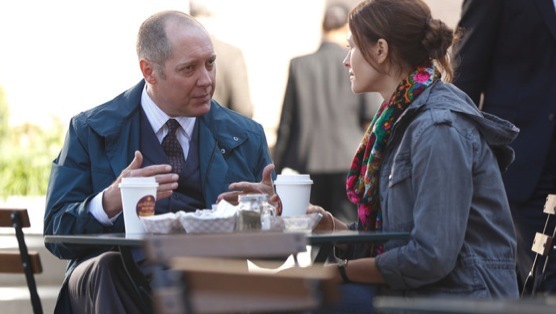 But if it can’t pull off the surprises (like this week’s episode), The Blacklist could take a break at a disappointing low point.